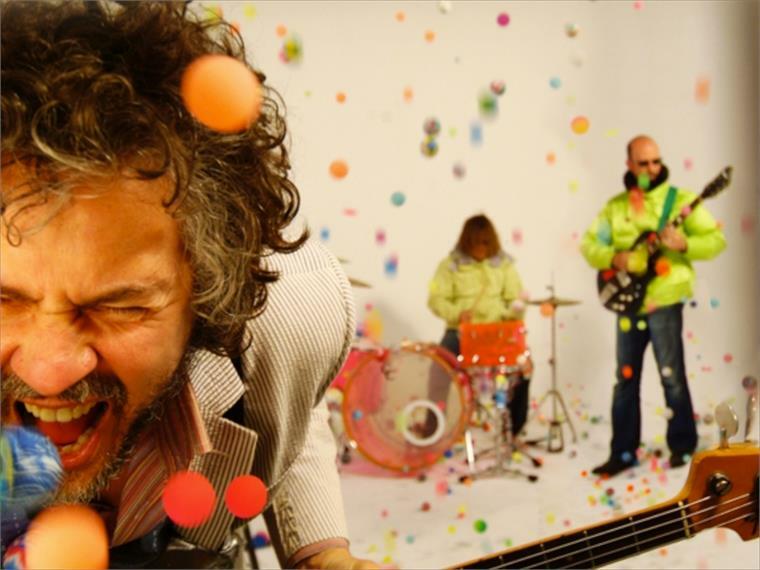 American alternative rock band The Flaming Lips are collaborating with music television channel MTV for a performance that will see the band travel across the US and perform in eight locations over a 24-hour period. The feat, put on for MTV’s O Music Awards, marks an attempt to break the Guinness World Record for the most live performances completed in different locations over a 24-hour period. 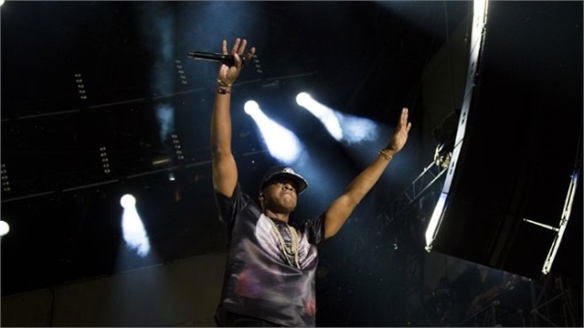 Rapper Jay-Z currently holds the record. Beginning in Memphis on June 27 and ending in New Orleans, the marathon performance will run alongside the awards and will be streamed live on MTV’s website. This initiative suggests a shift in the way we create and distribute music in the digital age. 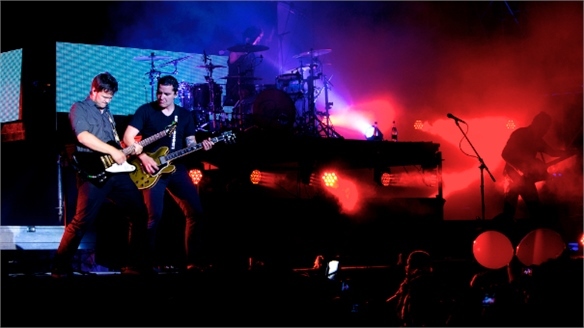 See our coverage of the Music Biz event in Los Angeles in 2012 for more. 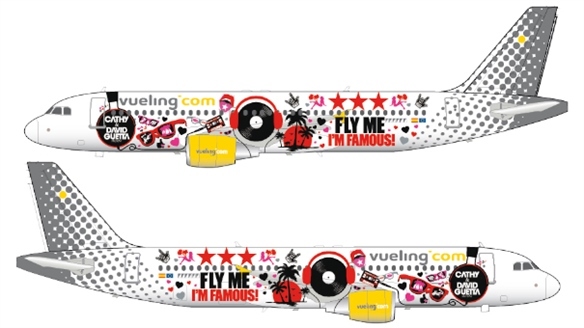 Branded Festival Experiences Branded Festival Experiences: Summe Summer festivals present retailers with the perfect platform to engage consumers beyond the shop floor. 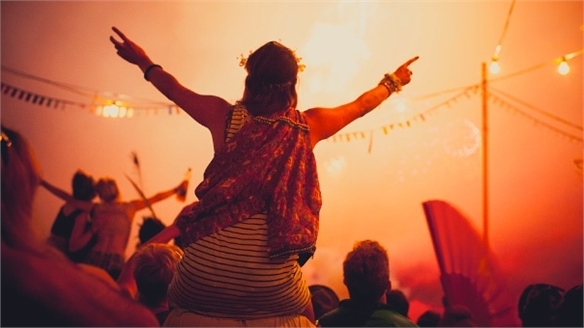 As festival season in the northern hemisphere draws to a close, Stylus surveys 2012’s best branded experiences. 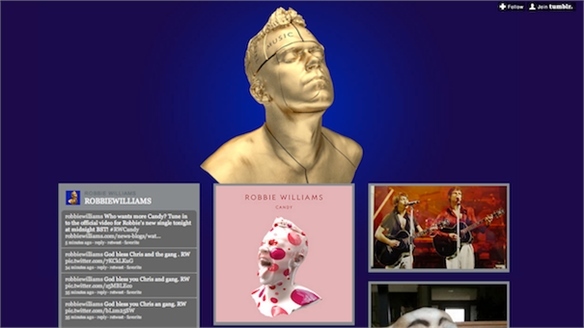 Robbie Williams’ Tumblr Blog Robbie Williams’ Tumblr Blog British pop singer Robbie Williams is leveraging micro-blogging platform Tumblr to create a rich fan experience in preparation for his latest album release, Candy. Budweiser Targets Music Fans Budweiser Targets Music Fans In a bid to market itself to a younger audience in a saturated market, American heritage beer brand Budweiser partnered with US hip-hop superstar Jay-Z for its Made in America music festival as a celebration of the brand and of music. Lady Gaga’s Multimedia Album Lady Gaga’s Multimedia Album Following in the footsteps of Icelandic singer Bjork’s multimedia iPad app album Biophilia, US pop sensation Lady Gaga yesterday announced her new album Artpop will be an app-based multimedia experience for the iPhone and iPad. 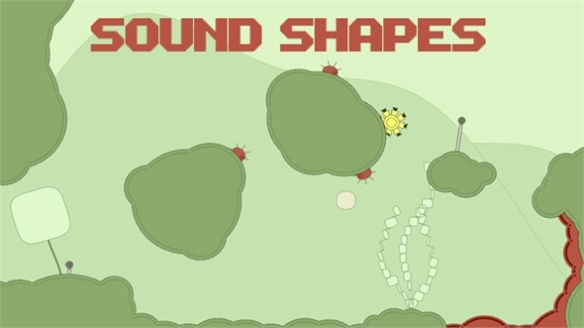 Sound Shapes: Players Become Composers Sound Shapes: Players Become Compos A unique new game by Toronto-based developers Queasy Games combines gaming design with contemporary music. Created for Japanese gaming giant Sony PlayStation’s new hand-held PS Vita device and Playstation 3 console, Sound Shapes encourages players to create their own musical experience in their own gaming levels. 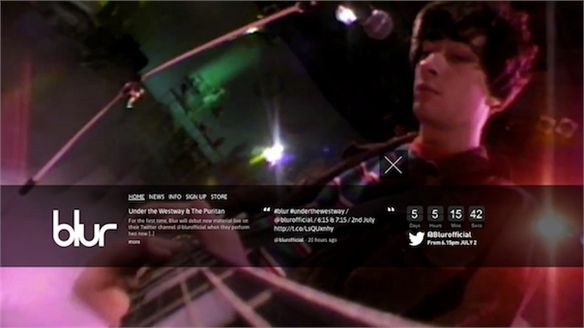 Brit Band Blur Turns to Twitter Brit Band Blur Turns to Twitter British alternative rock band Blur is tapping into new digitally and socially-led ways to market its music and engage with fans by streaming unheard tracks live onto the Twitter-sphere. Coca-Cola’s Downloadable Concert Coke's Downloadable Gig In an innovative example of how to harness social media and create an engaging experience for consumers, soft drinks giant Coca-Cola held a concert in Colombia where music fans could literally ‘download’ the band. 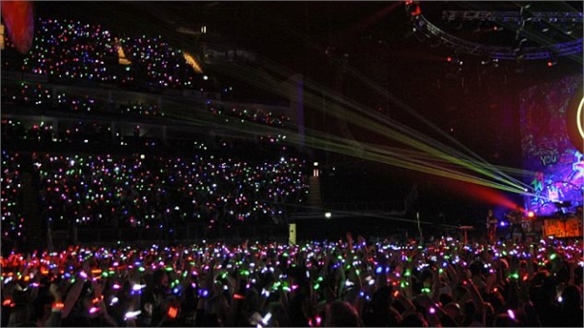 Coldplay’s Interactive Engagement Coldplay Interactive Chart-topping Brit band Coldplay is employing social media and digital technology during its current US tour to engage fans and create a tantalising visual display – demonstrating keen marketing strategy and concert innovation. 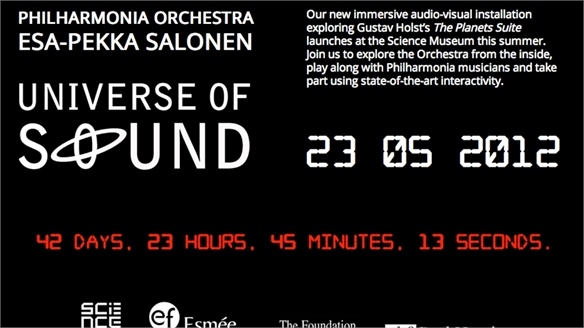 Universe of Sound Universe of Sound Universe of Sound, a new digital installation at the London Science Museum allows visitors to experience a virtual Philharmonic Orchestra. Future of Social TV & Entertainment Future of Social TV As technology develops and consumers start incorporating channels with multiple viewing platforms, the big entertainment talk at South by Southwest Interactive (SXSWi) focused on the future of TV, and how to move on from social and ‘the three screens’. 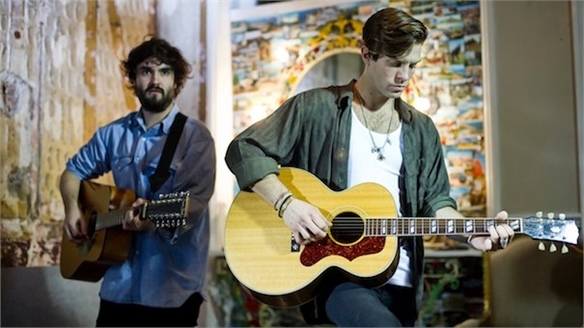 Mulberry’s Mix Tape Tour Mulberry’s Mix Tape Tour To celebrate Valentine’s day (February 14), British luxury brand Mulberry has recruited five up-and-coming musicians and bands to cover their favourite British love songs for an exclusive Mulberry Mix Tape online. 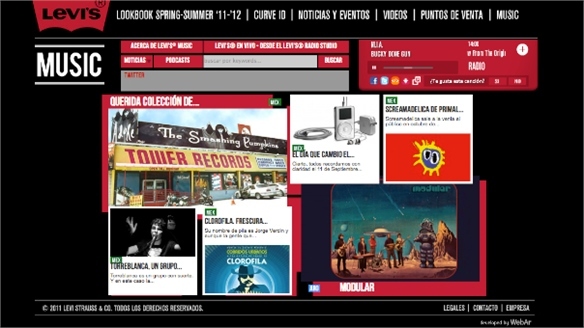 Levi’s New Music Platform Levi’s New Music Platform International denim brand Levi’s has launched Levi’s Music América Latina – a platform that marries creative music content, cultural news, references and inspiration for the whole of the Latin America region. Be My Guest: Turning the Tables on Music Marketing Be My Guest: Music Marketing Once, the music industry looked in danger of being decimated by the internet. 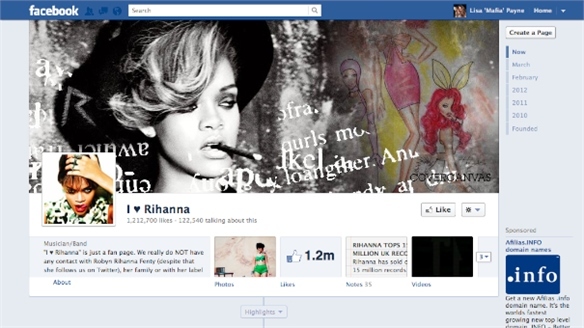 But now musicians are deploying their brand power. Stylus interviews Raphael Aflalo of Paris-based Be My Guest – a new music marketing agency that builds links between stars and advertisers. 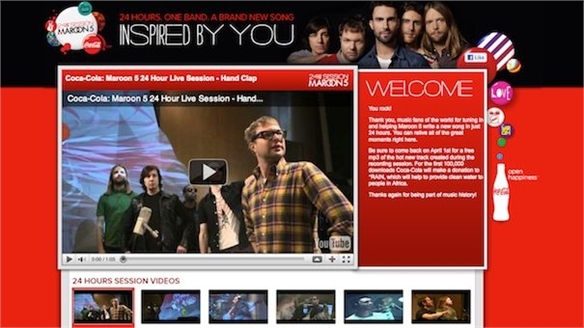 Coca-Cola and Maroon 5 Coca-Cola and Maroon 5 Last week, pop band Maroon 5 played a 24-hour music session at a studio in London as part of the new Coca-Cola Music Campaign.